TL;DR: Use the nourharidy:ssl package. I’ve been doing some Meteor development lately. There was a need to run the local server under a real subdomain (instead of localhost) with HTTPS. So I googled and found this StackOverflow answer which seemed to be exactly what I needed. Turns out that it had issues with web sockets hanging all the time. So I turned to Google once more and found this little gem of a comment which pointed me in the direction of the nourharidy:ssl package. First, we need to install the package. Then, you should put the certificate files under the /private folder of your app. You can change the 8000 port to any other port. If you want to avoid using sudo it should, however, be above 1024. Meteor is now running at https://dev.example.com:8000/. After a bit of trial and error, this seems to be the most simple solution for running the local development server under a real subdomain with HTTPS and not involving any separate nginx proxies. This can be useful for example for Facebook OAuth testing. I hope this comes in handy to someone at some point. A while ago I encountered thle following one-liner snippet in a legacy codebase. Yes, it was a one-liner! Alarming. So, what does it do? Let’s tear it apart and see. Wrong structure (array instead of string) for the job. tl;dr: Don’t blindly write @session_start(); and hope for the best. Use a session handler! Not long ago, we were in transition from using Memcache to using Redis. Up until that point we were saving sessions to Memcache, but due to reasons beyond the scope of this blog post, we decided to migrate to Redis. As for any smooth transition, we kept Memcache up and ran Redis beside it so there would be no downtime in between deployments. After the deploy all went well. All apps were up and running. We decided to keep Memcache up for a few more days, just in case. And we forgot about that. After some time, a system admin notices we still have Memcache up. Obviously the transition to Redis was made and we don’t need Memcache anymore, so he shuts it down. Suddenly some parts of the system start failing. Red alert, this cannot be good, why is it trying to connect to Memcache, when we removed all code related to it? So what was going on? Yes, he even suppressed errors, so we received no error messages related to that particular line of code. There was no session handler in place. Coincidentally, the servers had session.save_handler and session.save_path set to Memcache servers and everything worked just fine. Up until the point when the system admin decided to shut down those Memcache servers. Lesson learned. We managed to quickly resolve the issue by putting our existing session handling system in place. So, please, please, always make sure you know where  and how your sessions will be stored. Especially if you are writing an app that is running in high-availability infrastructure. Writing a session handler could not be easier. If you are running PHP >= 5.4 - and you should! - this is as easy as implementing the \SessionHandlerInterface. There is a nice example in the PHP documentation. For Memcache and Redis there are probably a lot of already written session handlers out there as well. This was a short post on how something so simple can go pretty much very wrong. So I hope this will at least make someone not repeat the same mistake when dealing with sessions. Happy coding! In early August I, amongst other ZCEs, got an invitation from Zeev to give their Technology Preview of Zend Z-Ray a try. However, since all systems I could test this on with Apache installed were CentOS and they only support it on Debian / Ubuntu, I had to try it in another way. So I had a box without Apache installed and for reasons beyond the scope of this post could not install it. So, basically I had an extension that would run just fine, I just needed something to access it’s Web UI. And so the router script for PHP’s built-in web server came about. You can find it on GitHub. 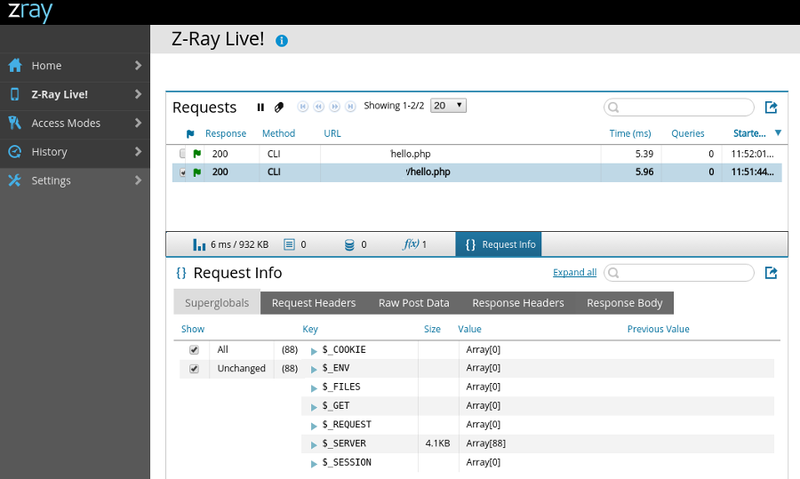 You can grab the Zend Z-Ray Technology Preview here. Now all you need to do is follow the installation instructions from Zend (ignore the apache part) and run the web server. You can of course bind it to another port and/or host, that works just fine. Then just navigate to the host:port URL and you will see the UI. Navigate to Z-Ray Live! and you can now monitor any CLI script that is being executed. This way you can get extensive debugging information on any cron script that is running in the background. If you are using the latest stable versions of either Eclipse or Zend Studio on Ubuntu with KDE installed you might have run into some trouble along the way. If you have oxygen theme installed the IDE will crash whenever you want to create a new project. Or maybe the close buttons won’t work. Plenty of problems. However there is a simple solution which I found digging around the comments in bug reports. All credit goes to Axel Müller for pointing to the original comment made by Hugo Pereira Da Costa. P.S. : The workaround for this is quite old. However since google search does not provide the straight up answer and the problem persists in latest Ubuntu 14.04 LTS I have decided this is worth a post. If you want to override Hadoop job configuration options, you can do so via command line -D key=value. hadoop jar MyJob.jar MyJob -D key="something,else" -D key2="jdbc:mysql://host?user=u&password=p"